In the words of Matt Damon — and I’m paraphrasing — I thought there’d be, like, campaign posters for Alexandria Ocasio-Cortez and Bernie Sanders on the walls. I’m sitting at the bar at Democracy Brewing in Downtown Crossing on a Thursday afternoon, and the after-work crowd is pouring in. Colleagues enter in groups and cluster around long tables, the human embodiment of Slack conversations held earlier in the day. It’s a beer bar, made obvious by the brewing equipment sunken below the restaurant’s main floor and visible through windows facing the street. The menu is pro-labor: There are beers called Suffragette Pale Ale, Consummate Rioter, and Workers’s Pint, the latter of which sells for a blue-collar price of $5. Despite the politicized beer names, CEO James Razsa says the bar doesn’t explicitly lean left or right. The brewery opened last summer. Like the Equal Exchange coffee chain, Democracy is a worker-cooperative, and after a year each employee attains one share of the company. Jason Taggart, who for the last eight years brewed at John Harvard’s in Cambridge, is the brewing director. Ben Waxler, veteran of La Morra and Ten Tables, is head chef. I’m here for the beer, but early in the evening they’re out of every IPA and pale ale. I settle for Cellar Door, an English style bitter (5.4 percent ABV) with a “heightened hop profile and notes of black tea and sweet malt” that drinks like its description. Little Big Pour is next, a Belgian-style ale (8 percent ABV) with characteristic notes of banana and clove. The 1919 Strike Stout, which the bar is calling an Irish-American style, has the dryness of a Guinness with the strong, chocolate notes of something from here. All the beers are straightforwardly good, which Razsa says is by design. 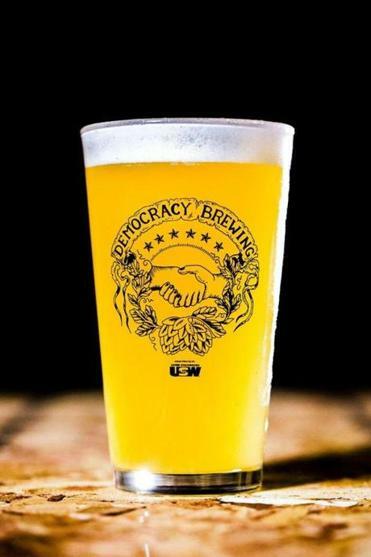 Democracy Brewing, 35 Temple Place, Boston, is open daily.